People pull in a woman a wheelchair. She was injured when a truck bomb exploded in the center of Mogadishu on October 15, 2017. 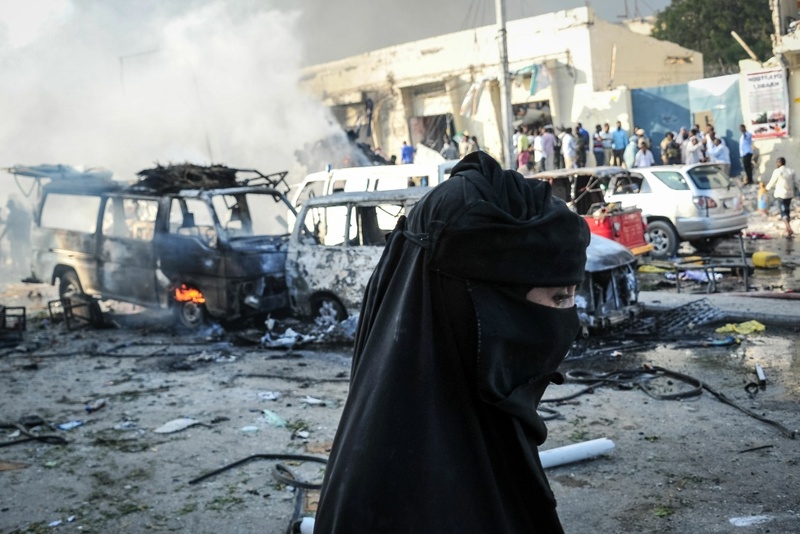 The most powerful bomb blast ever witnessed in Somalia's capital killed at least 276 people with many more injured, making it the deadliest single attack in the nation. The death toll could rise. 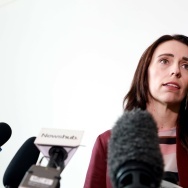 On Saturday, a truck bomb exploded on a crowded street near key government ministries, including foreign affairs. Many of the bodies in mortuaries have not yet been identified. Somali security officers patrol the scene where a truck bomb exploded in the center of Mogadishu on October 15, 2017. 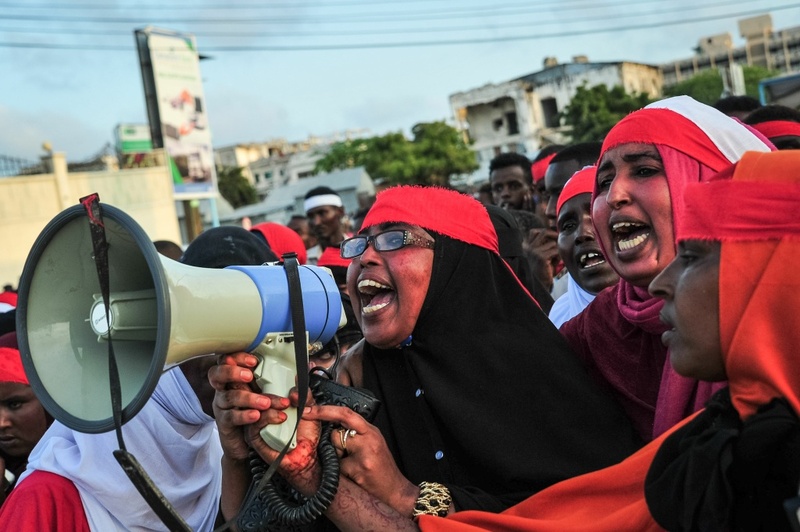 People chant slogans as they protest after a truck bomb exploded outside of the Safari Hotel in Mogadishu on October 15, 2017. Doctors at Mogadishu hospitals struggled to assist badly wounded victims, many burned beyond recognition. "This is really horrendous, unlike any other time in the past," said Dr. Mohamed Yusuf, the director of Medina hospital. Two men carry a man who was injured when a truck bomb exploded in the center of Mogadishu on October 15, 2017. "Nearly all of the wounded victims have serious wounds," said nurse Samir Abdi. "Unspeakable horrors." The smell of blood was strong. Men carry a stretcher of after a truck bomb exploded in the center of Mogadishu on October 15, 2017. A teary-eyed Hawo Yusuf looked at her husband's badly burned body. "He may die waiting," she said. "We need help." Ambulance sirens echoed across the city as bewildered families wandered in the rubble of buildings, looking for missing relatives. "In our 10 year experience as the first responder in #Mogadishu, we haven't seen anything like this," the Aamin Ambulance service tweeted. "There's nothing I can say. We have lost everything," wept Zainab Sharif, a mother of four who lost her husband. She sat outside a hospital where he was pronounced dead after hours of efforts by doctors to save him. 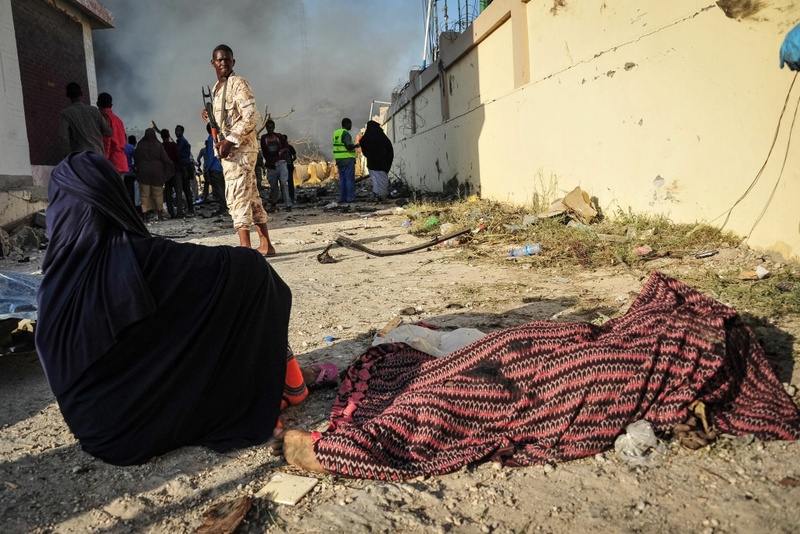 A woman sits by the body of a victim near the site where a truck bomb exploded in the center of Mogadishu on October 15, 2017. 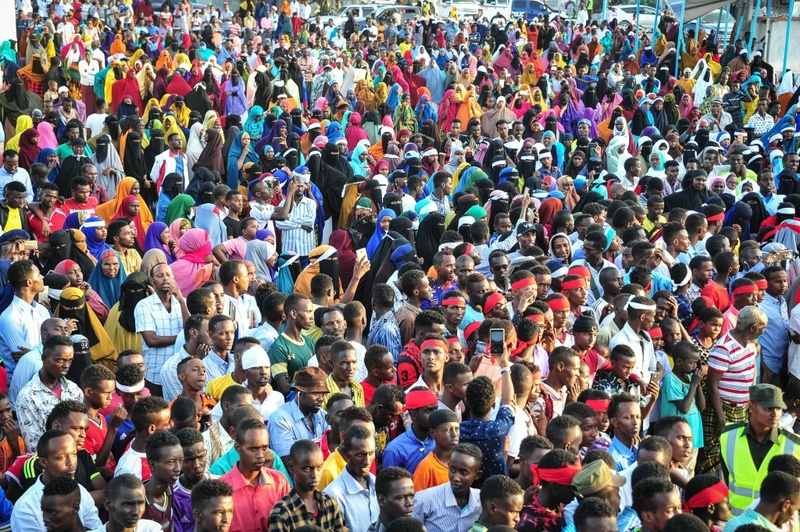 The country's Somali-American leader, President Mohamed Abdullahi Mohamed, declared three days of mourning and joined thousands of people who responded to a desperate plea by hospitals to donate blood. 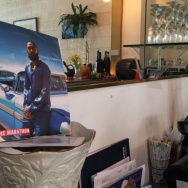 "I am appealing all Somali people to come forward and donate," he said. Mogadishu, a city long accustomed to deadly bombings by al-Shabab, was stunned by the force of Saturday's blast. The explosion shattered hopes of recovery in an impoverished country left fragile by decades of conflict, and it again raised doubts over the government's ability to secure the seaside city of more than 2 million people. Somali soldiers patrol the scene where a truck bomb exploded in the center of Mogadishu on October 15, 2017. 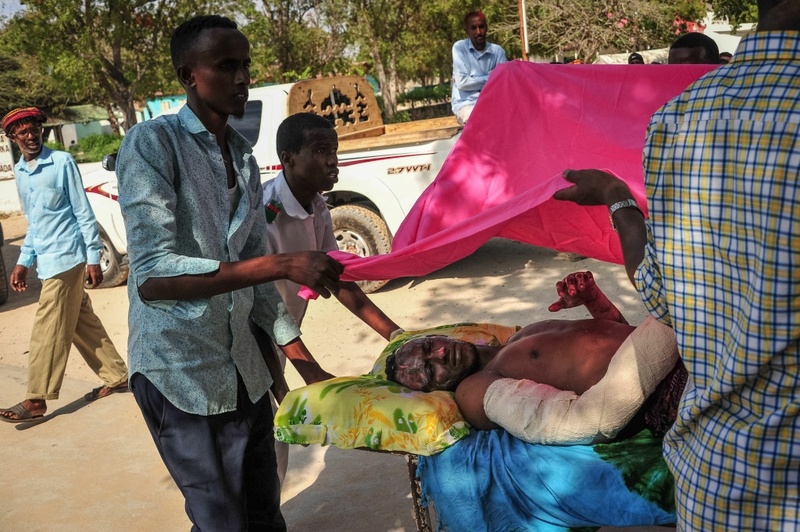 "They don't care about the lives of Somali people, mothers, fathers and children," Prime Minister Hassan Ali Khaire said of the attackers. 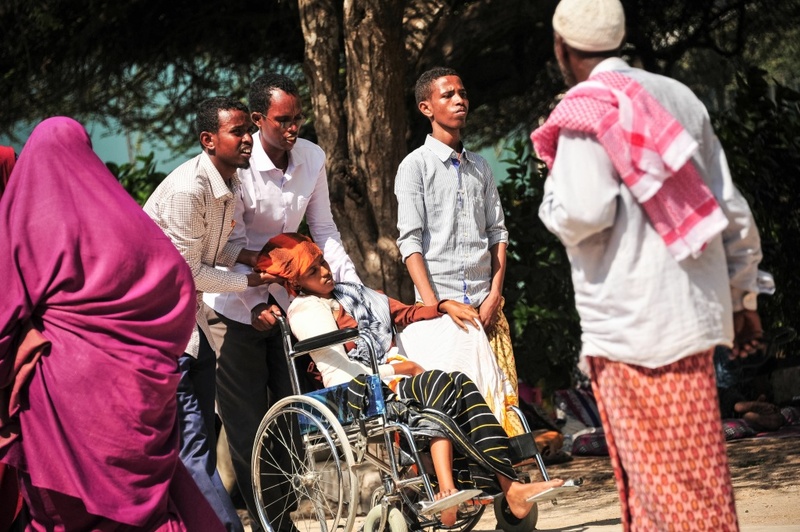 "They have targeted the most populated area in Mogadishu, killing only civilians." 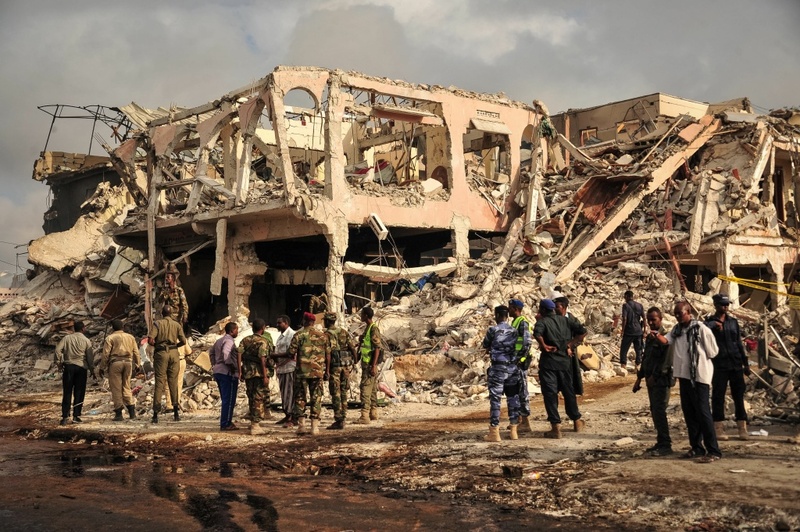 Rescue workers searched for survivors trapped under the rubble of the largely destroyed Safari Hotel, which is close to Somalia's foreign ministry. The explosion blew off metal gates and blast walls erected outside the hotel. 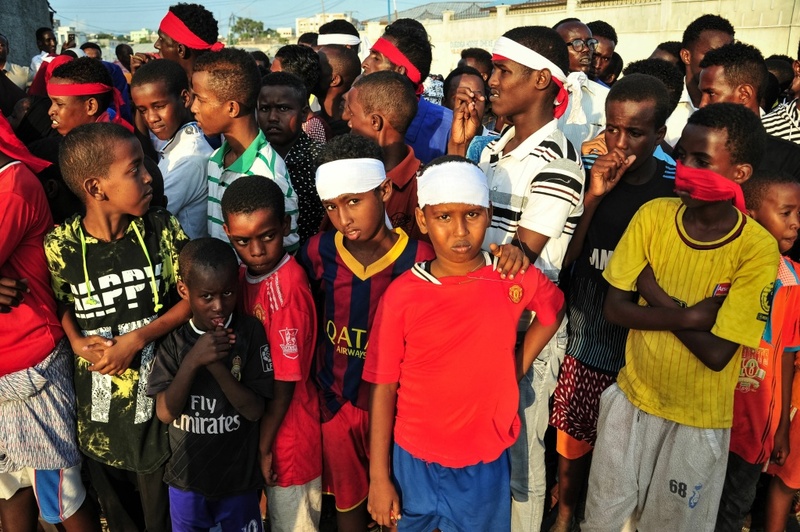 People wear headbands as a sign of anger as they protest after a truck bomb exploded outside of the Safari Hotel in Mogadishu on October 15, 2017. 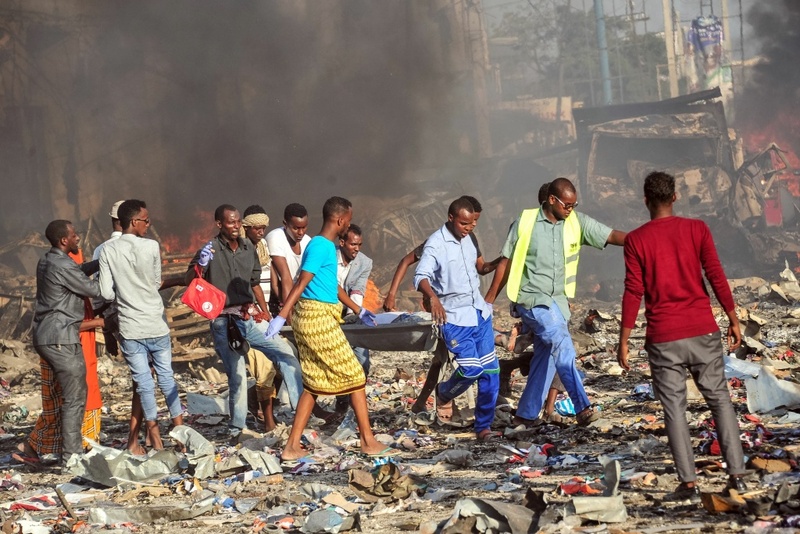 The United States condemned the bombing, saying "such cowardly attacks reinvigorate the commitment of the United States to assist our Somali and African Union partners to combat the scourge of terrorism." It tweeted a photo of its charge d'affaires in Somalia donating blood. But the U.S. Africa Command said U.S. forces had not been asked to provide aid. A spokesman told The Associated Press that first responders and local enforcement would handle the response and "the U.S. would offer assistance if and when a request was made." A woman walks by wreckages of vehicles after a truck bomb exploded in the center of Mogadishu on October 15, 2017. The United Nations special envoy to Somalia called the attack "revolting," saying an unprecedented number of civilians had been killed. 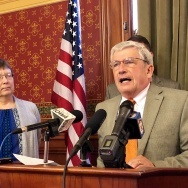 Michael Keating said the U.N. and African Union were supporting the Somali government's response with "logistical support, medical supplies and expertise." The spokesman for U.N. Secretary-General Antonio Guterres strongly condemned the attack and urged all Somalis to unite against extremism and work together to build a "functional" federal state. 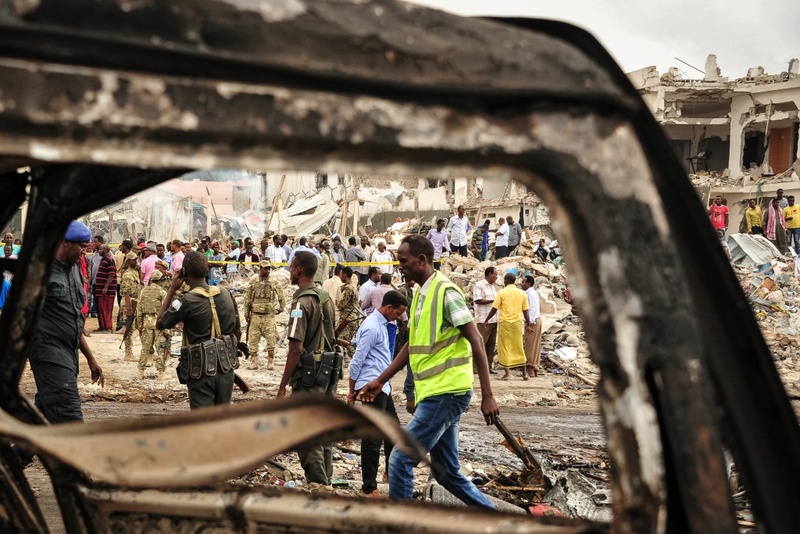 Saturday's blast occurred two days after the head of the U.S. Africa Command was in Mogadishu to meet with Somalia's president, and two days after the country's defense minister and army chief resigned for undisclosed reasons. People protest after a truck bomb exploded outside of the Safari Hotel in Mogadishu on October 15, 2017. "It's a dark day for us," he said. Associated Press video journalist Mohamed Sheikh Nor in Mogadishu, Somalia contributed.